Spiruline GT2. 100% fun oriented, the GT is for pilots looking for simplicity. Little Cloud’s Spiruline GT2 is out, It’s all about Simplicity and Fun! A small and compact wing, The GT2 has sharp, precise handling and a good upwind glide, offers a few extra kilometres per hour compared to a standard paraglider. It has short lines and a small turning radius, allowing it to core very efficiently in small thermals. The GT2 is safe and well-pressured with long brake travel of 70cm, the last 10cm of which are heavy to avoid inadvertent stalls. Its performance is better than the GT, with a slightly higher aspect ratio (4.7 vs 4.5), optimised cell widths and a lower line consumption. New V-rib construction and larger cross vents have allowed 200-300g to be shaved from the weight – the GT2 weighs 3.4kg to 3.9kg. It’s made from Dominico’s 35g Dokdo cloth which has good durability. 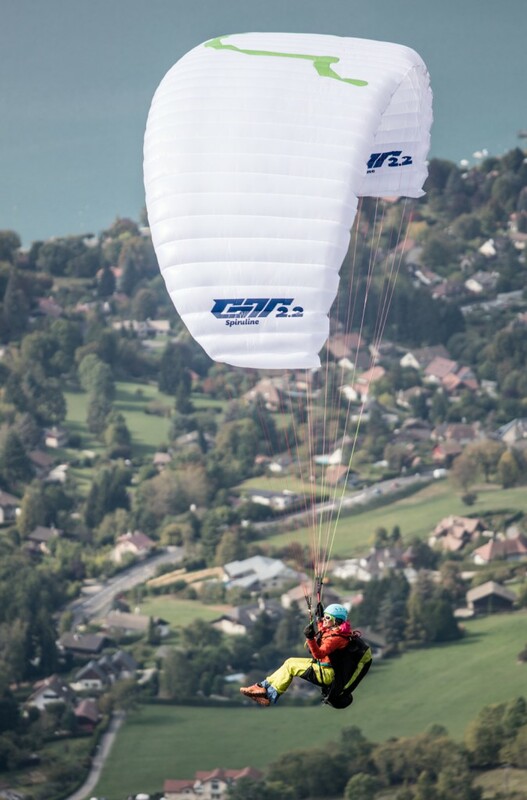 The GT2 is available in multiple sizes each size having an optimum, extended and a paramotor weight range. In the ‘optimum’ range the wing is safe and forgiving, suitable for teaching in schools. It’s load tested only, but LC suggest it’s the equivalent of a low EN B in this sector of the weight range. The more you load it, the faster it will fly and the sharper its handling. Light Weight Version for the aficionados which helps saving weight and packing volume. Little Cloud Spiruline GT2. Is 100% Pure Fun Fun Fun!